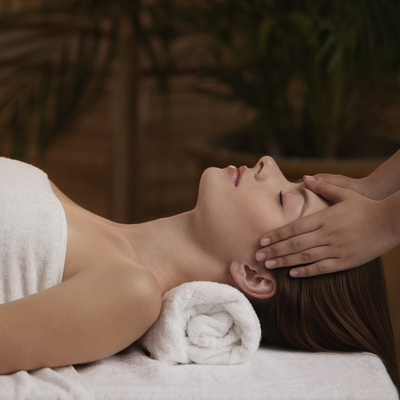 As wellness of the mind is key to wellness of the body, we offer a calm surrounding of classic elegance. Our serene décor and thoughtful amenities relax and prepare our clientele for rejuvenation. Offering a comprehensive menu of facials, massage, pedicures, manicures, and specialty treatments designed to meet the needs of each spa guest. A highly skilled massage can use acupressure trigger points to release tension, increase the circulation of blood, and heighten the body's life force energy to aid healing. Acupuncture and acupressure use the same healing pressure points, but acupuncture employs needles, while acupressure therapy uses gentle but firm finger pressure. Advantages of integrating massage with acupressure points include relieving pain, trauma, burnout, backaches, headaches, insomnia and maintaining good health through self-care. By relaxing the body and relieving stress, acupressure strengthens resistance to disease and promotes wellness. Our customized facials begin with face mapping to specifically address your skin conditions and needs. Our skin care specialists will discuss and choose the right products to optimize the results of your very own facial, leaving your skin the best it can be!